Bratz peel and stick mini murals are an exciting way to transform your child's bedroom or playroom into a pixie fashionista's paradise and this super cool Bratz Fashion Pixiez giant wall decals set is sure to be a hit! 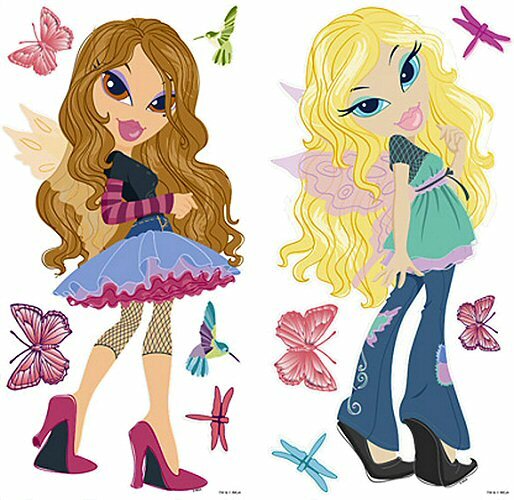 Featuring Chloe and Yasmin decked out in pixie-perfect style, along with coordinating butterflies, dragonflies, and hummingbirds, this Bratz Fashion Pixiez repositionable mini mural set is quick and easy to use. Our Bratz Fashion Pixiez giant wall decals (also known as peel and stick murals) are repositionable, removable, re-usable, and washable... the perfect combination for wall decorations used in decorating children's bedrooms or playrooms. This Bratz Fashion Pixiez peel and stick mini mural set offers decorating ease with no damage or residue to the surface. Note: ™ & © MGA Entertainment, Inc.